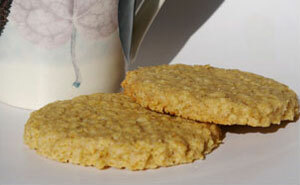 These cookies taste like a cross between flapjacks and shortbread, everyone seems to love them. I have heard that dribling chocolate over them while they are still warm is also very nice. Recipe makes approximately 2 dozen cookies. Combine the oats, flour and brown sugar. Cut in the butter until the mixture resembles coarse crumbs and form into a ball. Either roll out to ¼ inch thick and cut with cookie cutters or press into the bottom of a baking pan. Bake at 375°F (190°C) for 12 to 15 minutes.